Examining the roots of screen dependency. Remember to add ccfc@commercialfreechildhood.org to your contact list. If you are having trouble viewing this email, view a web version here. Most conversations about children and screen time focus on a particular age range, such as young children, tweens, or teens. This webinar will connect the dots between early excessive screen use and youth media addiction. 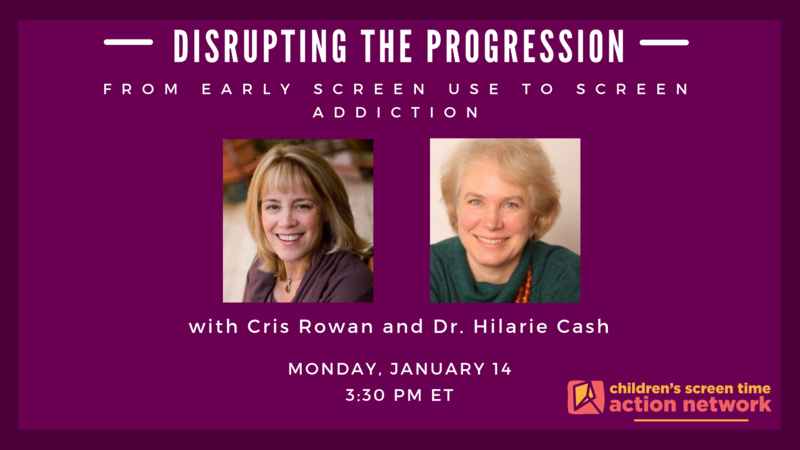 Join experts Cris Rowan, occupational therapist and founder of Zone'in Programs, and Hilarie Cash, Ph.D., co-founder and Chief Clinical Officer of reSTART Life, PLLC, as they provide specific, practical, early interventions that prevent children's screen use from impacting their future. Accounts that come from children themselves illustrate exactly how early, unrestricted screen time and media content undermined their relationships, education, and opportunities. Did someone forward you this email? Sign up and get CCFC updates directly to your inbox!